Don't expect to have fuel for your gas powered generator! Gas pumps need electricity to work. Gas generators are great for a long weekend without power or even a week or two following a hurricane--provided gasoline is readily available. Not many of us though, have the ability to safely store large amounts of gasoline for long term future events and gas generators are noisy. In a long term event, It would even be almost impossible to store enough batteries for our flashlights and radios. So, what can we do? In the past 10-20 years, portable solar power has emerged as an affordable alternative energy source for remote cabins, campers, hikers and sailors. You can use the sun to power many small appliances and technology applications like lighting, small TVs, cell phones and laptops. Unlike large, expensive whole house solar systems, these new portable systems are affordable and are available in many configurations. Your needs and your pocketbook are the main factors to consider. For crisis situations, you would need to decide what would be absolutely essential electrical needs for your family and go from there. 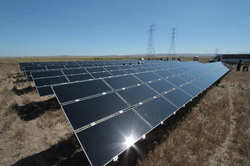 NEED MORE SOLAR? 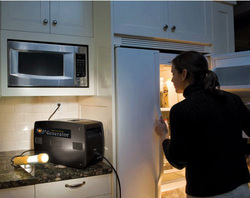 Click here to learn more about powering up a group of lamps, small refidgerator, raidos, TV etc. A Year Too Soon is Better Than a Day Too Late! Imagine the difference in your quality of life if, in an emergency, you could have the ability to keep foods cold, maintain cell phones charged for communication and have some light!